Photo: The Honourable Alexis Jeffers, the minister responsible for public utilities on Nevis (extreme left), takes a first-hand look at the new 3.85 megawatt-Wӓrtsilӓ generator being unloaded at the Nevis Electricity Company Limited’s power plant at Prospect on June 27. CHARLESTOWN, Nevis – Installation of the new 3.85 megawatt-Wӓrtsilӓ generator at the Prospect power plant has commenced. 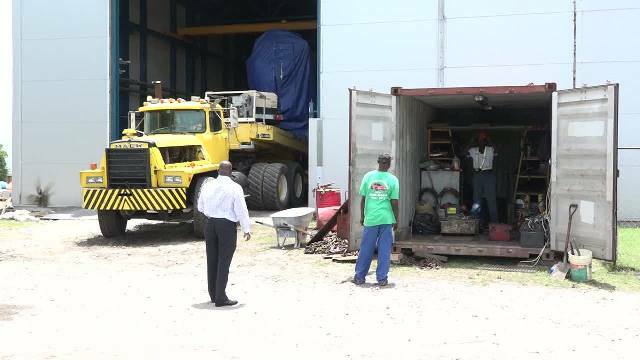 The US$5 million engine arrived on Nevis June 24 after being shipped by the Finland manufacturers April 20. Some months ago, the Nevis Electricity Company Limited (NEVLEC), with support from the NIA, purchased the engine in a bid to provide a more reliable supply of energy on the island. The new engine is expected to be installed by July 22 and ready for the testing phase. Jeffers said he is pleased so far with progress and thanked the public for their patience. Meantime, he noted that significant work has been done on other generators at the power plant they were force to put off grid.